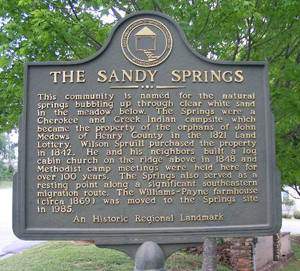 Sandy Springs is one of the most elegant and affluent residential communities in the Atlanta metropolitan area. With a variety of real estate options, home buyers are sure to find what they are looking for, from townhomes and starter homes to classic, stately homes to estates and mansions. In addition to its upscale business district, Sandy Springs also has more than 260 acres of parks and recreation areas, providing an array of activities for all ages. Sandy Springs easily competes with intown Atlanta areas that are well-known for excellence in dining and shopping opportunities. Located both inside and outside I-285, commercial districts include “Downtown Sandy Springs,” located near the intersection of Abernathy Road and Roswell Road, and neighborhoods such as Riverside to the west bordering the Chattahoochee River, Perimeter Center which shares a border with neighboring Dunwoody, the Dunwoody “Panhandle,” near Perimeter Center, and North Springs located north of Abernathy Road and west of Georgia 400. For singles, young couples and families, empty nesters and everyone in-between, Sandy Springs offers an array of housing options. From high-rise condominiums to pedestrian-friendly townhouses, sprawling estate homes to friendly suburban neighborhoods, you’ll find homes of all types in conveniently located Sandy Springs.